By 1971 the UK rock music scene was undergoing change. The psychedelic era was on the wane as a Syd Barrett-less Pink Floyd departed from the surrealist brilliance of Piper at the Gates of Dawn. Progressive rock, with Peter Gabriel at its helm dressed as a transvestite fox, was getting grander and more conceptual. David Bowie was about to christen himself Ziggy Stardust and Led Zeppelin and Black Sabbath were ushering in a new heavier sound with their own reinterpretation of the blues. 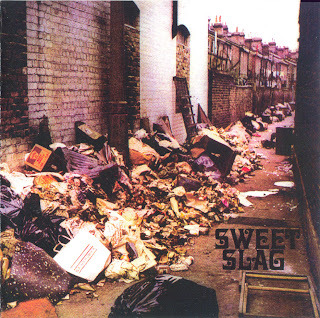 With this in mind it’s difficult to see where Tracking with Close Ups, the sole album by UK band Sweet Slag, fits into the music scene at the time. Practically nothing is known of the band, except that they were a four-piece outfit from London and cut their solitary album for the President Record label. Sweet Slag’s music is less concerned about creating anthemic popular rock like Zeppelin or Sabbath, and though their sound could be deemed psychedelic or progressive the over all feel of the album is darker with none of the pretence that would be normally found on albums in these genres. In truth Tracking with Close Ups owes much to the free experimentation of Zappa and Beefheart, with references to avant guarde composers such as Karl Heinz Stockhausen. Each of the seven songs on the album are experimental with the entire band soloing freely and seemingly without direction. The tight drumming of Al Chambers and steady bass of Jack O’Neill just about manage to hold the threads of the ideas together. This freedom of expression can be a bit off-putting for the casual listener, but as in the best avant guarde work of John Coltrane, there are moments when all the ideas and discordant improvisations come together and intricate melodies weave their way out from the maelstrom. “Rain Again” repeatedly morphs through different styles and time signatures over it’s 10 plus minutes, beginning with hazy horns over Chambers’ lazy funk break-beat, before quickly disintegrating into cacophony. ‘Twisted Trip Woman’ with its incessant bass riff is also a highlight, with a middle section which sounds like it could’ve been lifted straight off of a Plastic People of the Universe LP. Vocalist and lead guitarist Mick Kerensky takes writing credits for all seven songs, and his lyrics are full of bleak imagery concerning his complete hatred and mistrust of society. “World of Ice” is the most psychedelic track; a slow eerie 'stoner rock’ tune much akin to “The End” by the Doors. An embodiment of Kerensky’s paranoia, its eerie bass riff and swathes of atmospheric percussion lead on to his tortured guitar solo, which moves by turns discordant and delicate to create something truly beautiful and melancholic. Suicidal fairly sums it up. The final track ‘Babyi Ar’ is based on the poem by Yevgeny Yevtushenko about the Jewish massacres at Babi Yar in 1941 perpetrated by the Nazi's. Kerensky screams the song title repeatedly over the horrific noises conjured up by the rest of the group. It stands as a poignant homage to the darker side of the human condition, and a fitting way to end an album so eager to explore this part of mans psyche.